Warren Buffett always had big ambitions. His goal as a kid was to become a millionaire by the time he was 30. And he did it. But he hasn’t always been the 2nd richest man in the U.S. (and the 3rd richest in the world). Warren Buffett didn’t even become a billionaire until he was 50 years old. In fact, 99% of Warren Buffett’s net worth was earned after his 50th birthday. How much does he have today? According to Forbes, Warren Buffett’s net worth in 2015: Over $66.7 billion. The timeline below was put together by GoBankingRates.com. After graduating college, Buffett worked for his father’s brokerage firm as a stockbroker. When Buffett was 21, his net worth was shy of $20,000, reports Dividend.com. At age 24, Buffett was offered a job by his mentor, Benjamin Graham, with an annual salary of $12,000. According to U.S. Census Bureau data, this was already about three times the annual median income for the average family in 1954 — proof that Buffett was well on his way to fortune. By the time Buffett reached 26, his net worth was $140,000. When he reached 30 years of age, Buffett’s net worth was $1 million. In 1960, the average family income in the U.S. was $5,600 per year. Compared with Buffett’s $1 million net worth at the time, men who were working full time only made $5,400. By age 35, according to Dividend, Buffett’s partnerships had grown to $26 million. Buffett bought controlling stock in Berkshire Hathaway in 1965, according to CNN, and by 1968 his partnerships grew to $104 million. Going into his forties at age 39, Buffett’s net worth was listed at $25 million. 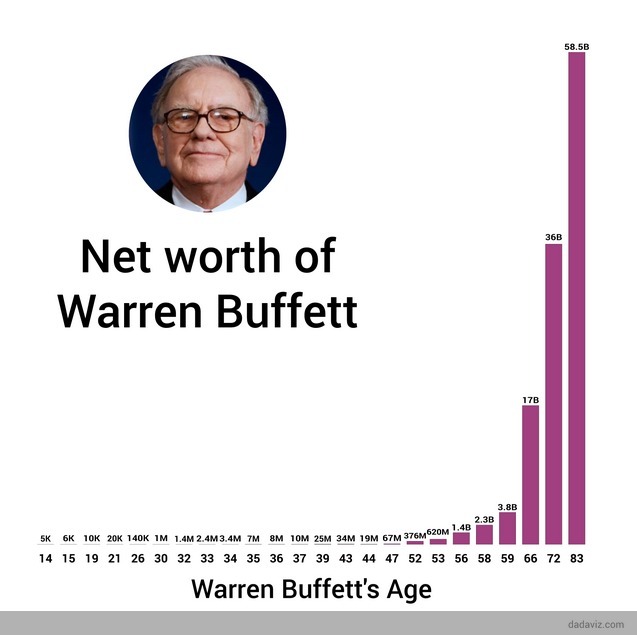 By age 43, Buffett’s personal net worth was at a high of $34 million. He used some of this capital the year prior to purchase See’s Candies for $25 million, reports The Motley Fool, and it became an investment that’s still profitable in 2015. But, the mid-1970s proved to be a rough period for Berkshire. By 1974, its decreasing share price lowered Buffett’s net worth to $19 million when he reached 44, reports Dividend. Never one to let his savvy investment skills fall by the wayside, Buffett was able to recover financially. By the end of the decade, he had increased his net worth to $67 million at age 47. By the close of the 1970s, the median U.S. household income was $16,530. Buffett’s net worth in 1982 was $376 million and increased to $620 million in 1983, according to Dividend. In 1986, at 56 years old, Buffett became a billionaire — all while earning a humble $50,000 salary from Berkshire Hathaway. Meanwhile, the average American family in 1986 was making nearly half of what the Oracle of Omaha was earning in salary; the median household income in 1986 was $24,900. As Buffett neared 60 years old, he was worth $3.8 billion. In a letter to Berkshire Hathaway shareholders in 1990, Buffett wrote that he thought the company’s net worth would decrease during this decade, and the second half of 1990 supported that. But late in the year, the company was able to close with a net worth of up to $362 million. As he entered further into his sixties, Buffet’s personal net worth grew as well — to $16.5 billion by the time he was 66 years old, states Dividend. The average American family began to creep up to Buffett in earning power during the 1990s. According to Census data, the median household income by the end of the decade was close to $42,000. Within six years — from age 66 to 72 — Buffett’s net worth more than doubled. His net worth at 72 years old was listed at a whopping $35.7 billion. But, Buffett is about sharing the wealth. In 2006, he released pledge letters that stated he will donate 85 percent of his wealth to five foundations over time, reports CNN. The median household income in 2000 was $42,148. As of mid-August 2015, Buffett’s net worth is $67 billion, making him one of the richest billionaires in the world, behind Bill Gates and Carlos Slim Helu. At 84, Buffett shows no signs of stopping anytime soon. And while he might have an 11-figure fortune, Buffett reportedly earns only $100,000 a year at Berkshire Hathaway and spends it frugally. Still, the master investor is making much more than the average American. According to the most recent Census Bureau data, the median household income in the U.S. is $51,939.